Invisalign® has quickly revolutionized the orthodontics world. Now patients have a different, modern option besides what they perceive as embarrassing metal braces. Dr. Gobbie and Dr. Deme are Certified Preferred Invisalign® Providers. The length of the treatment time will vary by individual, but the doctors will give you an estimated date of completion according to your progress and results. The average Invisalign® price is not that much higher than regular braces and the unique advantages Invisalign offers—like being able to take the aligners out to eat and brush your teeth—often outweigh the slight difference in price. The Invisalign® system combines advanced 3D computer graphics technology with the 100 year-old science of orthodontics. Since Invisalign is virtually undetectable, hardly anyone will know that you’re straightening your teeth. The aligners are designed to move your teeth in small steps to the desired final position, as prescribed by Dr. Gobbie and Dr. Deme. About every 7 days, you just pop in a new set of clear aligners until your treatment is complete. Achieve the smile you want with little interference to your daily life. You'll visit us about once every eight weeks, to ensure that your treatment is progressing as planned. Total treatment time averages 9 to 15 months. For best results, you should wear your aligners for 20 to 22 hours per day. Teenage years can be complicated. Your self-confidence will take a big boost thru the transformation of your new smile, even during the treatment with the aligners! Each set of aligners is worn for about 7 days, 20-22 hours per day. Aligners are removed only to eat, brush and floss. Your teeth will move slowly every week. The aligners are comfortable and smooth and custom fit your teeth. They can be worn playing football, soccer, basketball, and field hockey or even while playing the trumpet! One of the large advantages of Invisalign® Teen over conventional braces is the lack of wires, brackets and bands and other attachments that trap food around the teeth and gums. This will make it easier for you to brush and floss like you normally did, practically eliminating the risk of decalcification and white spots (the weakening of the enamel caused by trapped plaque). You’ll be smiling a lot! Invisalign Teen is practically invisible, so be confident and smile in all of your photos and selfies! Eat what you want—and chew gum! Because you can remove the aligners, you can brush and floss normally and eat what you want without trapping food behind them. Since the Invisalign Teen aligners are made of a smooth plastic and only move your teeth in small increments at a time, you won’t experience the pain associated with the tightening of a brace or wires poking you in the mouth. 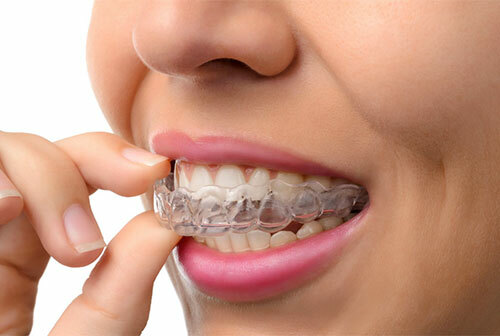 Invisalign also allows you to play sports or musical instruments without irritating your lips. You will have fewer appointments of shorter duration when you are being treated with Invisalign®—about once every six weeks, to ensure that your treatment is progressing as planned. Lost an aligner? Don't worry! Invisalign Teen offers six replacement aligners for free! If you lose an aligner, please inform Dr. Deme or Dr. Gobbie right away.